My son has a small closet and these hangers are wonderful. I put his sweatshirts and pants on these and they do not take up a lot of room. It actually makes his closet appear bigger and it is well organized. I have multiple sets of these organizers and they work really well - making good use of closet space. Works wonderful in my closet, gives me much more room! Used on a cruise and great if you have a small space, I often give these as extra gifts with a birthday present. I was glad to find these closet organizers. I had purchased a different brand from a different source and was very dissatisfied, they were very cheap. These are very good quality and a low price. 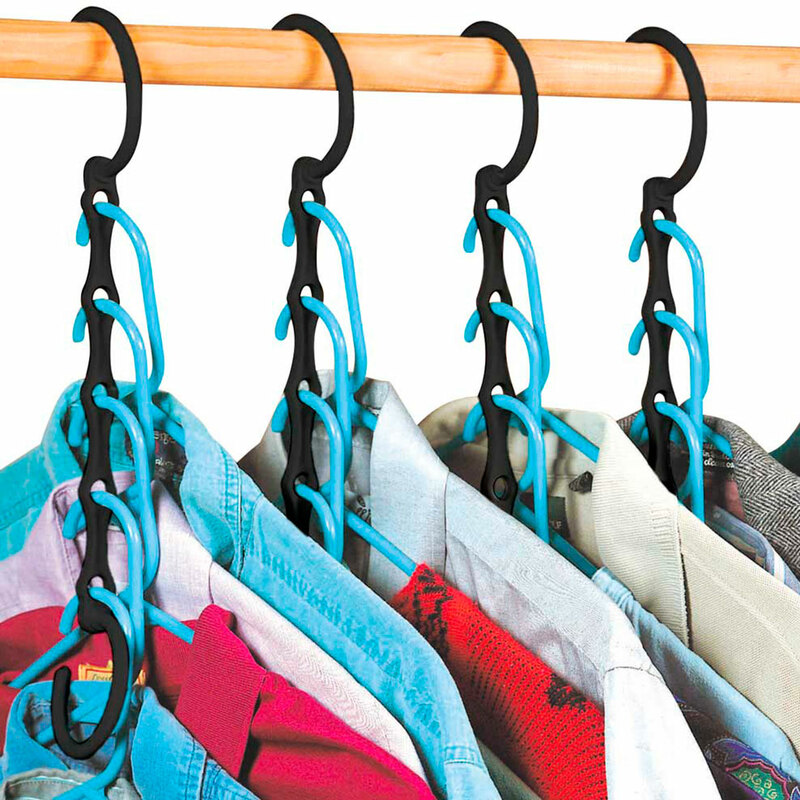 Hanger organizer is great idea.Definately saves space in closets. These save a lot of closet space & are easy to use. THESE ARE EXACTLY WHAT I EXPECTED. I'M QUITE PLEASED WITH THEM. I have poor closet space and this product has enabled me to put much more in my closets without creasing or pushing my clothes in. I have ordered many things from your company and was only disappointed by one product that I purchased. So far I would have to say that my business with you has been great. I think you offer fair prices for your merchandise and I love your SALES! Thank you for continually being consistent in your professionalism and accuracy. Product is easy to use and adjust to how you like the direction of your items hanging. It is a wonderful space saver and durable we used one just for suits that are quite heavy and it did the job. This is a great organization product. It saves space in my closet. Many items can be hung on one hanger. The closet organizer provided lots of space in my closet. I needed to get my whole season's wardrobe into one not very large closet, and it was entirely too crowded. With these organizers I have been able to create more "breathing" space and I love them. This product, the closet organizer is the grestest solution to messy cluttered closets or out of room for clothes closets. They add more room and they look nice and neat. I can sort my clothes much easier now. Gave me so much more storage in my closet. Because the hanger allows you to hang gaments so low to the floor you are using all at extra space. To me this product is great. I'm thoroughly enjoying it. Love the extra space. These are fantastic for coordinating outfits. Saves time when trying to find something to wear when you're running late. You don't have to search through the whole closet for things that match, because you already have pieces of an entire outfit hanging on one organizer & ready to wear. For example place tops that match slacks, skirts, shorts, etc., on one organizer. However, the more items hanging from one makes clothes a little bulky at the bottom, and sometimes requires some ironing. When you have little space for a closet, this helps solve the problem. You can get much in the same space. Needed more space in my closet. This helps. I've only used one of these so far and it seems to do the job. I'm concerned that they "seem" to be rather flimsy, but since I've only begun using them this is not a definite. I have four blouses on one of the hangers, and his definitely does save closet space and if they are durable they will be most useful. Love the organizers. They work well both vertically and horizontally but I wish they were a little stronger. They tend to sag when too much weight is hung on the vertical ones. But they offer both space saving when hung horizontally and neatness when hung vertically. I plan to purchase more of them. I'm not 'handy' and don't generally like things that need to be put together before use. It looks like it will serve the purpose for which I bought them. I use the product for my Tee shirts. t holds a lot of shirts. It needs to made stronger because the weight of the shirts is too much. The organizers make clothing hang very low in the closet. It does help with the crammed space though, but they are not as I had expected. IN the ads and catalog they appear different than the actual product. I have many of these which I picked up at yard sales years and years ago because they don't work unless one gets creative. But I knew this. I took them home and went to reinforcing each one with the hook I cut off of metal wire hangers. I use mine stretched out with the metal hanger hooked into the center hole to support it and keep it from sagging. The way I use them keeps my clothes from being smashed as I go thru my closet for an outfit. I am surprised the makers of this product has not ever improved the design and used actual metal for the two hangers on each side. The closet organizers are not strong enough. Once you put a heavier item, i.e. sweater, jacket, etc. they do not hold up and easily break. Not worth getting. Very disappointed! I have used this type of organizer for several years, however THIS one is by far the worst. It is for lightweight shirts/blouses only. I put lightweight jackets on it and the hook snapped right off the hanger. The clip that holds the hook to the hanger is very weak. I'm seriously considering returning them. This product is good for space saving, but the part of the item that hooks together is not that well made. Any weight at all tends to make it fall apart. I hate returning things, so I took some electrical tape and used it to tighten up the connections. So far so good. If I had known that they would have to be taped in order to stay together, I probably would not have bought them. I made 3 orders for this product. The first 2 orders worked great. The last order I received the plastic on the handle was so thin that as soon as I hung the clothes the handle broke and everything fell to the floor. They need to go back to original heavy plastic. This is totally useless. I've used these hangars for years; they are excellent. I have levis, etc. very heavy - no problem. The product that is represented in the picture is not what is being sold now. They are very weak and won't hold anything. I returned this last order very disappointed. Return was no problem.I haven't found a replacement. I thought this would save me space in my closet, but I did not consider how far down my clothes would be hanging. You need lots of space under your clothes to allow for the garments to hang from one hook. Too bad! Looked like a good idea. Not sure what to do with them now?? 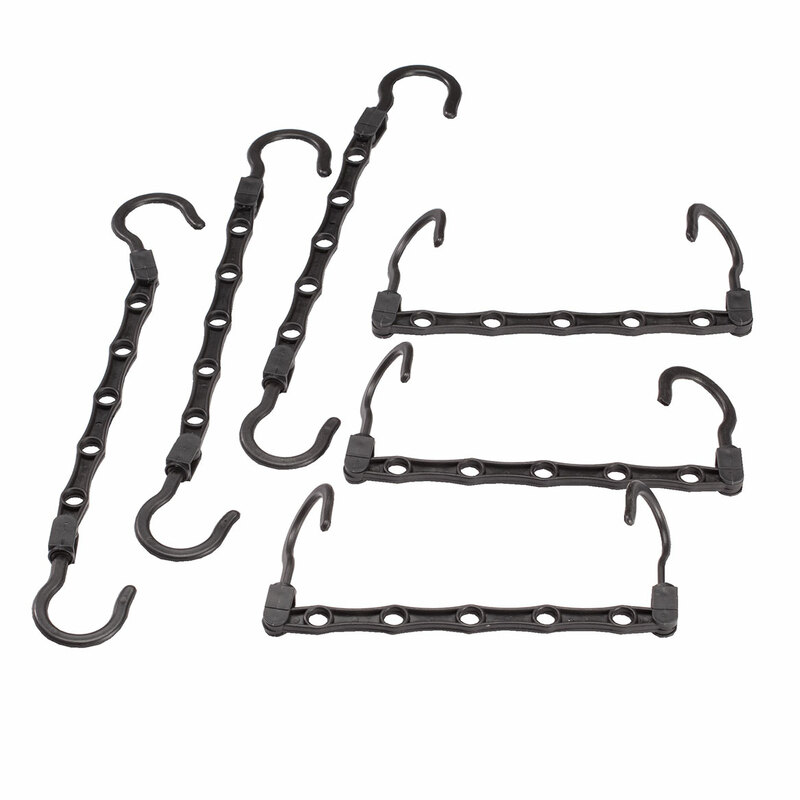 I have used similar hangers for many years and have been looking for more so I was happy to see these. However, I am not very pleased with them as they are cheaply made and the top hook breaks off very easily, even with lightweight clothes. I am using them after taping the two pieces together. easy to use and does the job - saves space. I have one of these, like the extra space for hanging clothes! It saves space when you need space-saving. Mother has some one buying more clothes for her, a few more would be very helpful. And for sweatshirts I use just the four hangers and leave one open. Due to a small closet I decided to try these hangers. Looks like they will hold a lot of clothes in a small space. Helps me keep my closet organized. granddaughter wanted as a space saver. I have a lot of clothes & limited closet space. I needed them & couldn't find them elsewhere. This item looks like the perfect item to help make more space in my closet. I have been looking for them for some time. It saves so much closet space. I even ordered a second set for my granddaughter. Because we have used them in our other smaller closets in our home and needed some more for another one. Love them! These are very hard to find, and are great for saving space in a small, over-crowded closet. I just need more room in my closet. I need this for my work clothes to save space. Have similar items, wanted some more. Good space saver 0n closet's hanging bars. I want my clothes to stay on the hangers and to get more room. I like that these hold all sizes of hangers without them slipping off.